One of the most memorable meals from our trip to Vietnam last year was at a restaurant called Cu Gach Quan (translates to ‘piece of brick’) in Ho Chi Minh City (Saigon). The company was wonderful: Billy, my cousin Michelle and her husband Vinh. The restaurant was eclectic, but authentic. The cuisine was familiar and delicious Vietnamese comfort food, served on charming mismatched hand-made plates and bowls, with little dipping dishes of blue and white porcelain full of nuac mam (Vietnamese dipping sauce) and soy sauce. Fried tofu with crunchy garlic was served alongside sautéed local greens, braised sweet and spicy clay pot fish, brown rice and what turned out to be our favorite dish of the evening: bo xao sa lat song or warm beef and watercress salad. 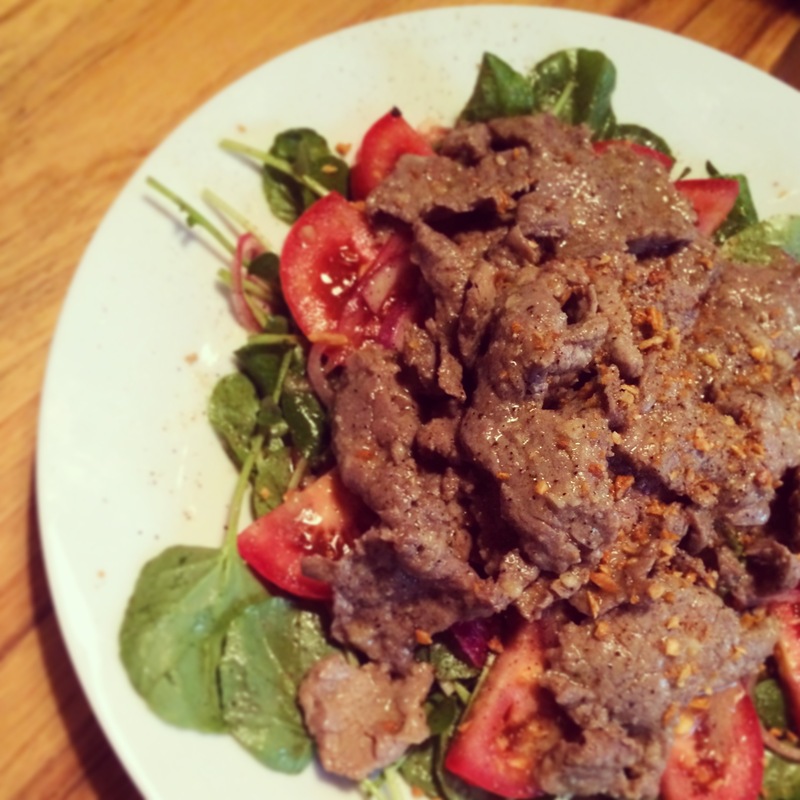 Hot, garlicky, stir fried beef served on top cool peppery dressed watercress with tomatoes and marinated onion slivers. Delicious! Since traveling to Vietnam every time we craved this dish was not practical, I questioned our waiter and promised Michelle I’d come up with a recipe replicating this dish for us. Below, you’ll find what I came up with based on our server letting us in on the main marinade ingredients: garlic, lime and fish sauce. If you ever find yourself in Ho Chi Minh City, I highly recommend you have at least one meal at Cu Gach Quan. Be sure to go to the original. We hear it’s better. They’re so popular, they opened one directly across the street—yes, really! In the meantime, try this recipe at home. It’s perfect with a bowl of jasmine rice. About 10-20 minutes before serving, in a small bowl, mix sugar, salt, pepper, lime juice and olive oil together. Add onions to dressing. Do not let onions sit in marinate for more than 30 minutes, it will get too soft. Toss watercress in onion dressing. On a serving plate, layer watercress, then tomato slices on the outer edges of plate. The hot beef will go in the center of dish, on top of watercress. Avoid placing hot beef on tomatoes as they will get soft and lose their bite. Heat canola oil in wok over high heat until very hot. Add minced garlic, stir fry for 30 seconds. Add beef with marinate and stir fry for 3-5 minutes or until beef is cooked through. Serve beef over watercress, topped with pan sauce. Sprinkle with fried garlic and a few crack of fresh pepper. This entry was posted in Cooking and tagged Beef, fish sauce, Gach Quan, garlic, ho chi minh city, home cooking, hot, Meat, recipe, saigon, salad, stir fry, tomatoes, traditional, travel, vietnam, vietnamese, vietnamese food, watercress, watercress salad, Yummy on May 18, 2014 by friedchickenanonymous.